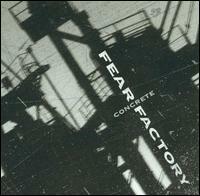 FEAR FACTORY - CONCRETE (CD) | Online Shop | Wizard LTD. Although released in 2002, Concrete was originally recorded in 1991 in Blackie Lawless&apos; studios. It was intended to be their first release, but the band wasn&apos;t happy with the record deal they were in, so they ditched their producer, Ross Robinson. When they were taken to court, Robinson won the rights to the album, and the band won the rights to songs. So Fear Factory ended up re-recording eight of the tracks from this album for their official 1992 debut, Soul of a New Machine. Incidentally, Robinson ended up using this album to promote himself, which would eventually lead him to producing Korn, which would make him the most sought-out nu metal producer of the 1990s. The band&apos;s record label (Roadrunner) released this album after their (now temporary) breakup to fulfill their contractual duties. Track 3, "Concrete" was later renamed as "Concreto" and rerecorded as a b-side for the Dog Day Sunrise single and later appeared as a bonus track for the Obsolete digipak. Track 15, "Piss Christ" is not to be confused with the song of the same name "Pisschrist", on their 1995 album, Demanufacture. Track 16, "Ulceration" is named after Fear Factory&apos;s former name. They were known as "Ulceration" while forming in 1989 before renaming to Fear Factory in 1990. Track 6, "Sangre de Niсos" was originally featured on one of the Cry Now, Cry Later 7" compilations. Fear Factory had recorded under the name Factoria de Miedo (which is Fear Factory in Spanish) to hide out from their major label. "Sangre de Niсos" in Spanish means "Children&apos;s Blood". Track 9, "Dragged Down by the Weight of Existence" was rerecorded on Soul of a New Machine as "W.O.E." (Weight of Existence). The opening guitar riff in "Echoes of Innocence" was used as a synthesized motif in "A Therapy For Pain", the final track on Demanufacture. The title also appears in that song as a lyric.